Am I supposed to see my own site? YES! You want to be there when your site is shown! You can answer any questions members might have about your site and even walk them through signing up to your site! What time does the server reset at Sweeva? Sweeva resets every day at 12:00am Eastern Time. Can I see that intro video again? YES! Simply Click this link to view Jon Olson explaining Sweeva. What's with these Ribbons and Awards? We give you thousands of credits and experience points for claiming ribbons, to learn how to claim them visit our Awards page. How do I sumbit a website to Sweeva? Once logged into the members area, go to the sites page to submit any websites you'd like to be shown on Sweeva. Next you'll create a bid on the bids page. If your bid is the highest for the times you selected it will be shown. How do I earn more credits to bid with? Purchasing credits is also an option. How long does it take for my bid to be accepted? Bids are chosen about 20 minutes to 1 hour before being displayed. You'll receive a notification with the time your site will be displayed. If your bid is too low, you'll need to increase it to get accepted. How long does it take for my website thumbnail to show? This depends on the number of websites in the system waiting. Priority is given first to sites that are going to be displayed soon, then to sites with active bids, then to sites without any bids. What are we allowed to talk about in the chat? The chat is for talking about the site being displayed. You can't use it to spam. 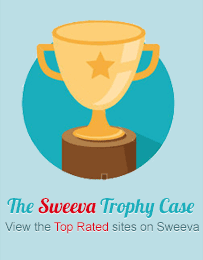 If you are the owner of the site being displayed you are allowed to talk about your site and answer any questions Sweeva members might have about the site. Where can I see what people said about my site? Click on view details next to your site on the sites list. What are Levels, Ranks, and Experience Points? You earn Experience Points for doing things on Sweeva like browsing, referring, etc. As you earn these points you'll increase in level. Different levels will unlock new features on Sweeva for your account. Once you reach the top level you'll have the option to Rank Up. 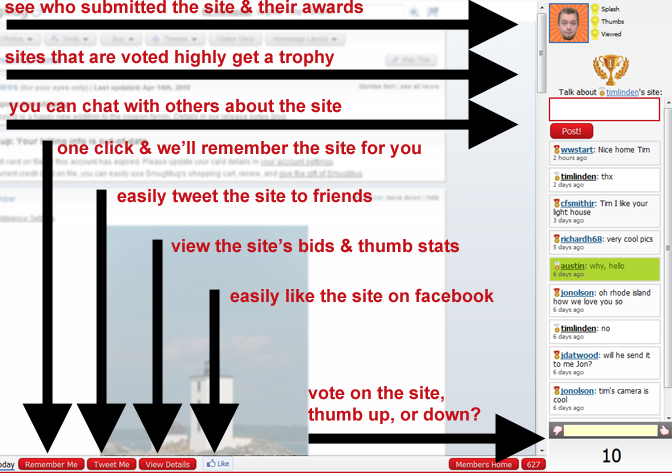 This clears your points and awards, but increases the number of credits you earn per page view. The drop-down on the Bids page doesn't work for me. For some reason, a small number of people are unable to use the drop-down box on the bids page. If you happen to be one of these people, you can check the "Old School Bids" checkbox on the profile page to fix this. Can I have a tour of the surfbar?